At this festive time of year, EB and TC like to do festive things, like remind everyone that Christmas is coming. It seems each year, Christmas comes and goes so quickly. So before Christmas has come and gone, we’d like to (hopefully) add to your Christmas joy by sharing “some several” unique and fun Christmas websites. You’ll want to bookmark one or more these sites if you have kids or grandkids, or if you’re a kid at heart. These sites are not listed in any particular order – so the first one listed is not necessarily the best and so forth and so on. Without boring you to tears, I am going to get started now. 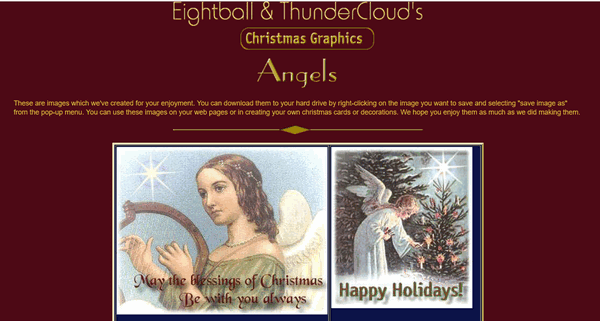 If you have kids or grand-kids, or if you still believe in Santa Claus, like I do, then you’ll want to visit this site on Christmas Eve. All I want for Christmas is for EB to quit flogging me. OK seriously – this is from the NORAD site by the official NORAD people, who you don’t want to mess with because they have their fingers on the buttons that launch nukes. Don’t write and criticize them. For over 60 years “…NORAD and its predecessor, the Continental Air Defense Command (CONAD) have tracked Santa’s flight. We would write an intro for this site, but since the developer of the site is so verbose, we’re just going to let him entertain you. I’d always loved Christmas (yes, I’m a very big kid!) and had wondered about the ‘whys’ of Christmas; such as why do we have Santa/Father Christmas, why we have Christmas Trees and send Christmas Cards to each other?! The site was originally created for some friends who were teachers in a local school. Knowing that I was a web designer, they came to me complaining that they couldn’t find a site that was child friendly and “wasn’t trying to sell the kids something”! So with the help of ‘Bruce the Spruce’ (the site’s Christmas Tree logo!) I made a little site for them to use with their classes. The site has always had a ‘no ads’ policy (although I’ve had plenty of offers!). As the site has become more and more popular the hosting costs have also increased! If you really like the site, you can help to keep the site online. As a Christian, the most important part of Christmas to me is the Christmas Story, when we remember and celebrate that Jesus was born in Bethlehem 2000 years ago. Head on over to WhyChristmas?com. Northpole.com celebrates the holidays with dozens of activities for children and families. 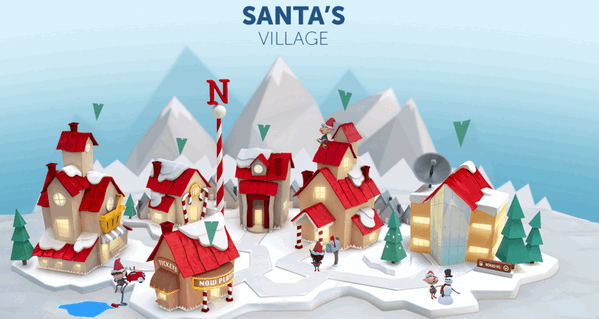 A child-safe, award-winning holiday site, northpole.com promotes a traditional look at Santa’s Secret Village at the North Pole, but with high-tech, creative features to keep children and adults entertained—all for free. The site opens with a panoramic view of Santa’s Secret Village?, the fanciful home of Santa, his elves, and reindeer. Visitors click on different ‘buildings’ to enter, leading to a variety of activities or stories. Buildings include Santa’s Mailroom, Santa’s Workshop, Gift Shop, Craft Cottage, Elf Clubhouse, Santa’s Reindeer Barn, Santa’s Den, Mrs. Claus’ Kitchen, North pole Weather Station, Elf Pal Academy, and Toy Shop. Letters to Santa arrive by the thousands each day during the holiday season and are processed in Santa’s Mailroom. There, children have a quick, secure, and certain means to write Santa AND get a free, keepsake-quality reply letter within days. In Santa’s Workshop, children can read short creative stories about elves and toys. In the Reindeer Barn, the stories are about Raymond the playful reindeer. 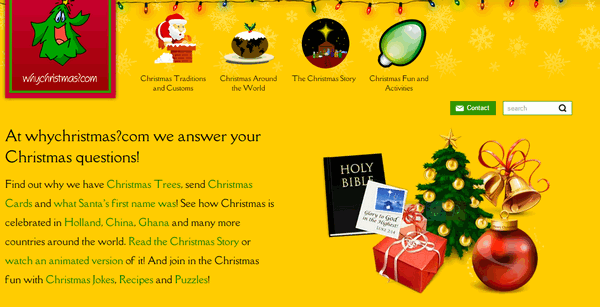 All stories on northpole.com are original, and many offer a gentle and upbeat lesson for children. Personalized, original stories await children in Santa’s Den and are created by the child (or parent) answering a few short questions, such as the child’s first name, hometown, and a favorite activity. These answers are woven into the story to personalize it for the child, and pages can be printed out as a keepsake or gift. After discovering that teachers were using the site in classrooms to teach computer skills, reading, and writing, site creators added the Elf Pal Academy, offering mind-challenging games, puzzles, mazes, math riddles, an interactive coloring book, even Santa’s favorite Rubik’s cube. A favorite is the Good Deeds Calendar that children can print and record their good behavior for Santa. Need a special recipe for the holidays? Mrs. Claus’ Kitchen has thousands! 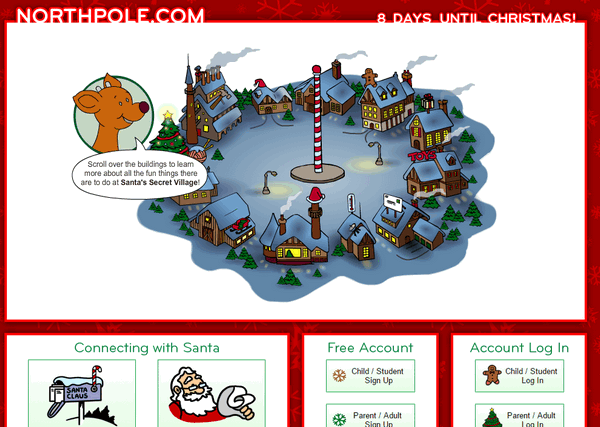 Also, at northpole.com there’s ElfChat?, animated holiday postcards, and an ‘elf-run’ weather station that gives updated North Pole weather reports. Let’s put on our coats, hats, boots and scarves and head to the Northpole, shall we? It is with bittersweet emotions that we mention the site that started it all. From our rise to the top as the biggest stationery site on the web and one of the top 500 web sites in the world, to the demise of stationery with the introduction Windows 7 (with no email program) to our current incarnation – geared to helping people all over the world with their Windows computers – we’ve seen the web grow and change so much. There’s a lot of innocence and naivete in our first collaborative effort. Looking back, it looks so simple and out-of-date. And whenever we revisit our first Web site, it brings tears and smiles. You’ll notice the midi (music) that used to play in the background dos not play in Chrome, Firefox, Edge or other browsers. However you’ll see that it downloads the small music file in the background. They are all beautiful Christmas midis. Looking back is bittersweet; it hardly seems like it’s been 20 years since we built our first Web site. Hop in Darcy and TC’s time machine, and let’s go back to where it all began. Thanks so much Libby. Merry Christmas. All the best in the new year. An opportune time to wish both EB and TC a BLESSED Christmas 2018 with a wish for continued good health , happiness and prosperity in 2019 ! Merry Christmas and all the best to you and your loved ones in the new year, David. Thanks for being with us. Merry Christmas! You are so appreciated!! Question….friends and family mostly have gmail. If I switch from gmail to Thunderbird so I can use Stationery, will my stationery show up when I send emails to the gmail users? Thank you! Thank you very much, Sue. Merry Christmas!